Home | Vinyl Siding Installation | Tis the season for installing vinyl siding? The best time of the year for installing vinyl siding, probably depends on whether you're doing it yourself, or having the job done professionally. Consequently, the decision about when to have vinyl siding installed, or when to install it yourself depends on the availability of a given contractor, your DIY expertise, and how dramatic the seasons are in your area. According to the website Cost Helper, the DIY cost can run $100-$200 per square; a square of siding amounts to 100 square feet. You can expect to pay from $300 to $600 per square to have siding installed, according to the website Vinyl Siding Source. Unlike wood, vinyl siding prices don't fluctuate significantly based on the seasons. The optimum temperature for installing vinyl siding is around 50 degrees, according to licensed construction engineer Todd Fratzel, writing for Home Construction & Improvement. 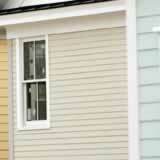 Vinyl has a higher rate of expansion due to temperature than other siding products. A 12-foot length of siding can increase five-eighths of an inch from winter to summer and then buckle if it's not properly cut to size during installation, Fratzel explains. When installing vinyl siding during the winter, someone needs to make specific calculations based on outdoor temperature, to account for the expansion and contraction of the vinyl siding and ensure proper installation. Ask the Builder suggests that "over 99 percent of all [vinyl siding] problems can be traced to installers." This reiterates the importance of checking references before hiring a contractor--and really knowing what you're doing before taking on a complex DIY project like siding installation. Because the bulk of vinyl installations take place during the spring and summer, Michael Hood of MBM Carpentry in Massachusetts recommends that you look for deals on vinyl installation during fall or winter. Installations jobs are less plentiful during the "off" seasons of fall and winter, so contractors may be hungry for projects to keep their crew working. If you're going to give DIY installation a try, it's very important to understand the process, have access to the right equipment, and to install in a bearable temperature, such as the early morning or dusk hours of Summer and Spring.